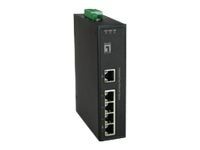 The LevelOne IFS-0501 Industrial Fast Ethernet Switch provides 5 ports at 10/100M TX to enable high speed network in mission-critical environments. With an industrial standard DIN-rail mount, this switch can be installed in a cabinet, and clearly visible status LEDs provide simple monitoring of port link activity. The switch is housed in a solid metal case rated at IP30, keeping it safe from dust, vibration, heat and humidity, while an operational temperature range of -40°C to +75°C makes it suitable for deployment in almost any environment.